Lee Evil and Dougy Gyro in his “Nautilus” costume. The tenth Edwardian Ball crept up upon us unawares, while we were still sleepy from holiday overeating and adjusting to our regular work schedules again. All of a sudden everyone seemed to say “This weekend? But I haven’t a costume!” And thus began the yearly scramble, with last-minute runs to the fabric store and safety pins carefully tucked away inside as-yet unfinished garments. 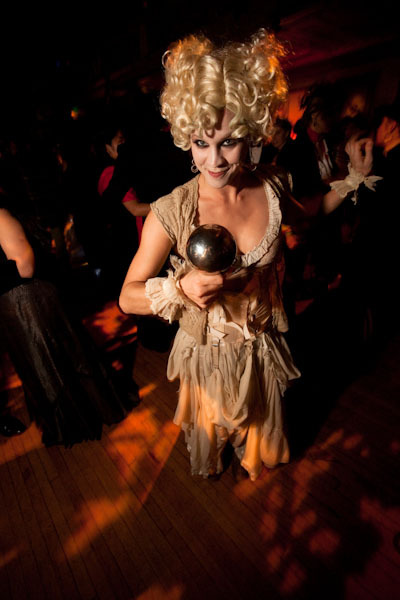 The Edwardian Ball is one of those rare events where everyone–not just the performers and regulars–dons a costume. For some of us this means little more than our everyday wear, while others brainstorm for weeks. A contact juggler amongst the revelers. 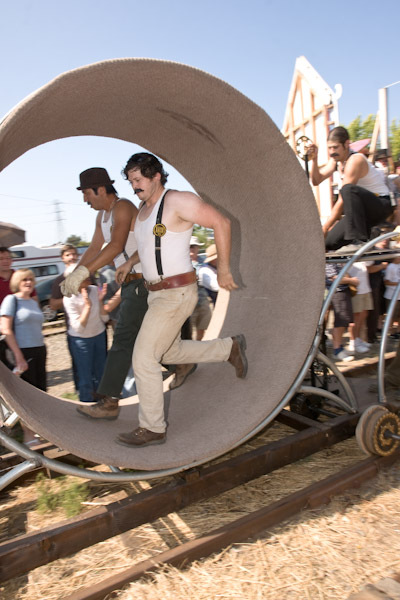 The Screaming Vortex races down the track. 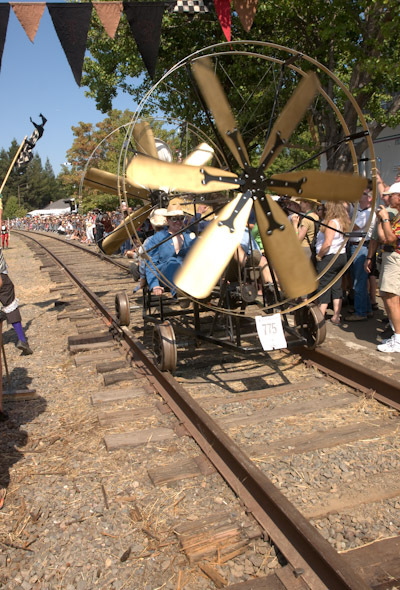 September 27th saw the second installment of the Great Handcar Regatta, an afternoon of nonsensical anachronism, whimsy and ingenuity in Santa Rosa, CA. Though temperatures burned hot in the triple-digits, many thousands of spectators and participants flooded the Railroad Square historic park, perusing vendors, sipping refreshments, seeing live music, and — of course — watching the races. Rock*N*Roll Sunday School Fixed Gear, powered solely by running, crosses the finish line. Official MC Les Claypool provided commentary to the thronging crowds, which were said to have reached nearly 10,000 (a keen-eyed friend said Tom Waits was among them), many of whom were dressed appropriately old-timey for the occasion.